As a founding member of the all-girl garage rock outfit Thee Headcoatees in 1991, a Billy Childish/Thee Headcoats offshoot band, Holly Golightly spent four years fronting the band and earning a modest, but rabid cult fan base. 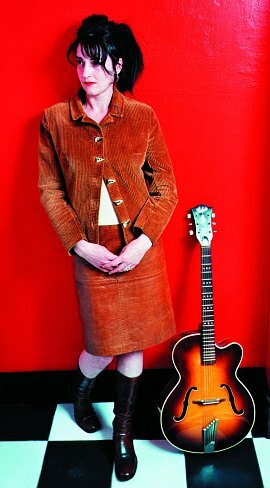 Leaving the group in 1995 to focus on her solo career, Golightly released her debut, The Good Things on the indie Damaged Goods. Whereas Thee Headcoatees were a product of Billy Childish's songwriting, The Good Things was Golightly's chance to shine and showcase her writing abilities. Still as raw as Thee Headcoatees, The Good Things broke away, preferring a mellower, more relaxed vibe as Golightly cuddles you with an intimate, if not conversational singing style while she laments about her broken heart and failed relationships. Golightly would soon follow up The Good Things with 1997's Painted On, this time for the Sympathy for the Record Industry label. Delving deeper into her bluesy, garage-rock charm, in the two years it took her to follow up her debut, Golightly would release four more full-lengths in the next two years, for various labels, including Damaged Goods and Sympathy for the Record Industry. Which brings us to "Truly She Is None Other", her 11th release (including a live album release and a 2-disc collection of b-sides/7"s), released on the Damaged Goods label. "There are years nothing comes out and some years three albums come out," she says of the unpredictable output. "Sometimes I don't pick up the guitar for six months or so," she continues, describing how she goes about writing her songs. "Other times I get away, go to a hotel or something, to write songs. Or go stay with a friend and bring the dog and do stuff away from my normal routine. Then I sit down and play guitar at night. I do it differently every time . There is no set way." When questioned about her diverse sound, encompassing garage rock, folk, blues, and R&B, all of which have been devilishly mixed on every release, from The Good Things through Truly She Is None Other, and her chameleon like ability to adapt one sound and then move to another effortlessly on the next track, all while making things sound relatively similar and rooted in the same mindset, Golightly thinks for a minute and then responds. "There are no contrivances to make it sound one way or another," she replies. "I record at the same place [Toe Rag or FatSounds Studios in London], with the same people [Liam Watson at Toe Rag and Ed Deegan at Fatsounds], every time. It makes it effortless, and another reason for the vast output when I do go in and record stuff." Writing and recording at the same place, with the same people, Golightly is able to shake each record up with her vast influences, while making each record very similar to each other. "I don't think the albums are that different in terms of the songs I've decided to record," Golightly suggests, when asked how she has changed over each record. She later goes on to tell me that Truly She Is None Other is one of her favorite records she's recorded. "It's definitely in the top three," she laughs. Following her U.S. tour, Golightly has been busy writing her next record, which she plans to start recording soon. Following the recording of her 12th record, she will tour Sweden and Denmark -- doing week jaunts through each country -- before hitting the U.S. again in April. When asked if she had any regrets, Golightly is quick to respond with just one: "I don't get enough time to write songs. I wish I had more time to write and record more songs." Look for Golightly to tour the U.S. again this spring, and, if the recording of another record is any indication, another record to be released upon us soon. Truly, there is none other than Holly Golightly.